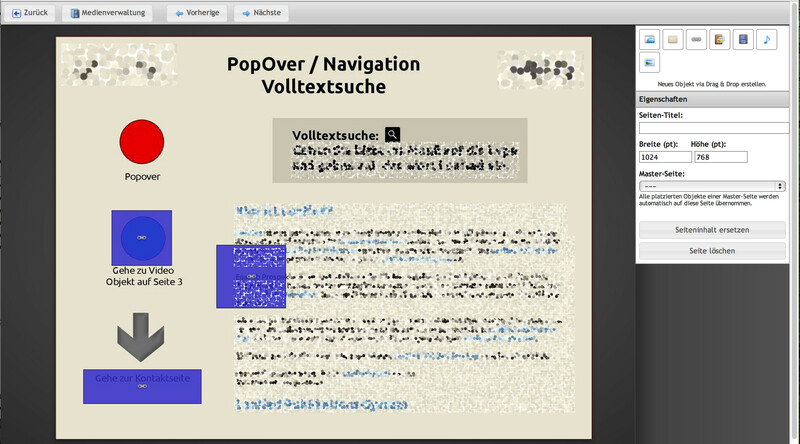 Below you can see a screenshot of a web-based page layout editor. It is basically a drag and drop WYSIWYG editor for interactive apps, and allows the user to use a page backdrop and add a "layer" of interactive elements to it, such as image galleries, videos, etc. New objects can be created by dragging one of the small "objects" at the upper right into the layout. After dropping, the new object will appear and can be edited. The menu bar/toolbar which allows the user to navigate within the whole interface. 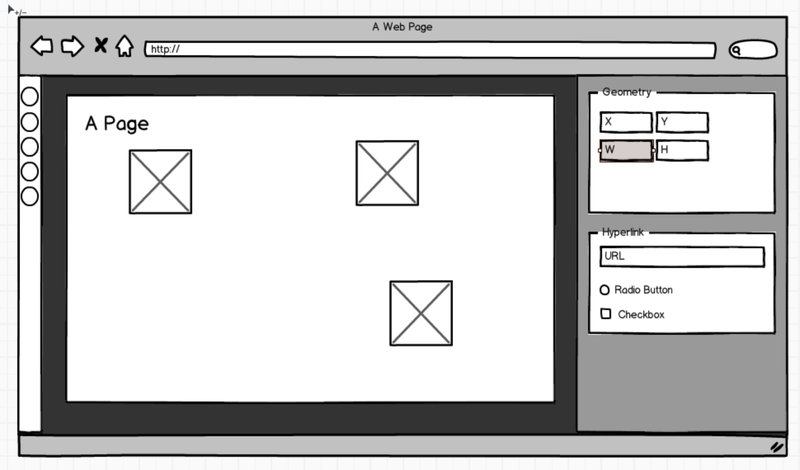 The page editor area on the left, which displays the preview of the page and allows placement of objects (blue boxes). This layout basically works, but I'm sure there are ways to improve the overall user experience. With the creation of new objects: Is there a better/more intuitive way than having the static list of object types at the upper right? Would it make sense to move this to the left side, possibly as a thin column? Most objects don't have very many properties, so a lot of space is usually wasted; although I'm not sure if that can be fixed without the use of modal dialogs (which I want to avoid, due to extra clicking). How could I avoid wasting space? I'd like to hear from experienced UI designers if there are best-practices for this kind of user interface? I'm quite biased by Adobe software. 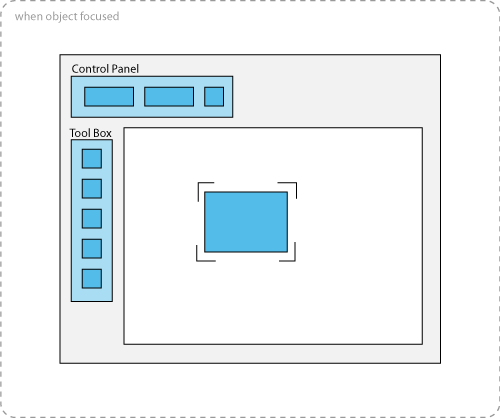 The panel that users use for editing the object is called a control panel (I took the name from Adobe Illustrator), and it is a horizontal panel located at the top. And as for the toolbox, you are right, thin column is better and should be at left side. So, the control panel at the top would be dynamic, it will change in content as the user focus between different objects. The default focus should be the web page itself, AKA nothing is being focused, in that case, you should let the users to modify properties of the web page as a whole, such as the size and alignment. If that's not a feature, then just have it empty. Move the the static list to the left as a column - as you suggest. Give it a short headline. Keep it slim, make it drag & droppable and choose clear & short names for the item types. If items can not be used multiple times, gray them out in the left column. Make sure the user understands where she/he can drop the items! The properties of the items should not be set in the left column. this would bloat the column and make it very complicated just to get started. I would "open" or "expand" the item right after dropping it on the main canvas, let the user do the settings right there. This has additional advantages: If you let the settings/properties be set in the left column, the user might think this is a general setting, as she/he is setting it in the left column without a direct link to the canvas itself. Less positive examples for similar applications can be found in the Salesforce page layout editor. It uses a floating horizontal block with the static list of items. This sticks to the top of the screen, used items are grayed out. It feels terrible. Not the answer you're looking for? Browse other questions tagged layout intuition interface editor or ask your own question. How would you improve this search results interface? How to show long navigation list horizontally?